Mo's word for today is SHINE. Have any of you ever heard of EARTHSHINE? 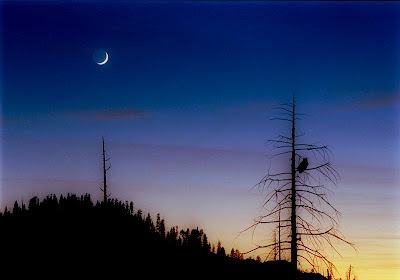 A crescent moon with Earthshine over Yosemite National Park in October 2004. Go over to Manic Monday for other participants. Beautiful! Spooky a little :) Is it an owl on that tree? Oh that ocean looks so inviting with the sun shining on the water. Definitely need some ocean. I don't ever think I've heard that term before, Mary. Thanks for enlightening me on Earthshine! I appreciate your participation in Manic Mondays! I've seen Earthshine, but I never knew it was called that. That video was fun, though! I've always loved that image, but I didn't know what it was called. That's way cool!